Arrived at the expo at around 1 pm. The plan was to get there early while there were no crowds, which I did. The first thing I did was check out transition, where I was happy to see assigned spots on the racks. Nobody wants to worry about stuff being moved after setup, so I’m sure it put many minds at ease. I was also happy to see that I had a pretty good spot–third from the end of a rack. Next, I walked down to the beach to check out the swim course. The water didn’t exactly look inviting, but the ‘M’ shape of the course made it look shorter and less intimidating than courses this long usually appear. On to get checked in, which went very smoothly. T-shirts were good quality and were not covered by sponsor logos like NASCAR vehicles, which I also liked. Also included in the SWAG was a very nice swim/run bag. It’s not really big enough for a tri bag, but it is sturdy and has a nice zippered bottom. After checking in, I headed up towards the Disney area to check into our place for the weekend, made a quick trip to the grocery store and Pollo Tropical for dinner that night. The rest of the family arrived about ~5:30, and we wolfed down dinner and headed to Hollywood Studios for a couple of hours. 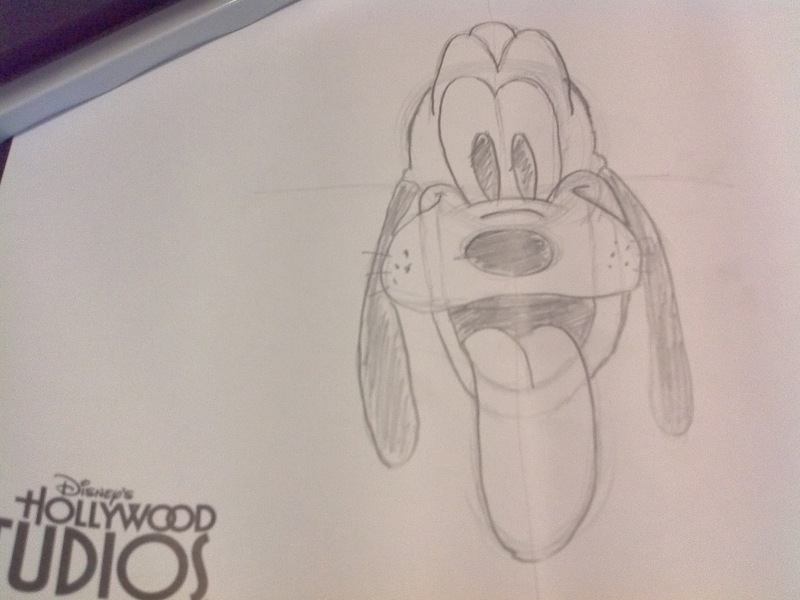 I learned how to draw Pluto there. It’s seriously the best drawing I’ve ever done, and that’s sad. Also, it’s probably the most impressive performance for the weekend, which is even more sad. I stayed away from the race and everything involved with it, which was a good decision. I did see some photos of the expo on Twitter that afternoon, and there were big crowds, making me glad I’d taken care of everything the day before. The Missus had a baby shower to attend, so she took the infant with her while I sat poolside (in the shade) while the oldest two went nuts for the afternoon. Some Orlando friends come over with their kids, which was awesome. I spent the entire afternoon, dinner, and evening hanging out with people who don’t do triathlons and don’t give a crap about them. So there wasn’t the usual time spent obsessing about the race and talking about training–very relaxing. Even the usual stress over packing was avoided because I was given an awesome gift–a great new transition bag that zips open and lets you see everything…no more packing and unpacking 100 times making sure you have everything. Was asleep by 10:00. Got up at 4:00 am and headed towards Haines City. Parking was no problem, and getting everything set up in transition went very smoothly. I made sure my tires were properly inflated and spinning around without rubbing on anything, grabbed a Gu and a bottle of Ironman Perform and went down to the beach to relax before the swim start. A lot of people were pretty caught up in the fact that Lance Armstrong was in the race, snapping photos in transition and standing up on the beach all morning to try to get a glimpse of him in the swim warmup and start. I’m not saying it wasn’t exciting that he was in the race (and man…did he kill it or what? ), but I decided he was just Competitor Number 4 and to focus on what I needed to do. That meant sitting down and relaxing as much as possible before the start. The biggest advantage of doing a WTC event (this was my first) is that the organization is incredible. Everything happened on time. I was in the 9th wave, about 35 minutes after the pros started. One big difference I noticed on the swim from other open water tris I’ve done is that it wasn’t a 300 yard washing machine and then clear swimming–it was pretty crowded the whole time, at least for me. When I got out of the water I glanced down at my watch and was very disappointed to see I was in the 40s. I was really expecting ~37 minutes, and 39 at the worst. I noticed that even the pros swam a little slower than normal though, so I guess that could translate into a few minutes difference for a guy like me. Either way, I’d decided months ago not to let the swim affect what I do later because it’s such a small part of the race overall. I don’t really put much into the swim, so I don’t expect that much out of it. My goal up until now has always been to just glide through it with as few strokes as possible and expend minimal energy. More on that later. Very happy with my transitions. No issues at all, even with putting on my HR strap. I decided to put my bike shoes on before mounting, and I’m glad I did. The start was on a slight uphill and there was lots of traffic. I passed several people in the first half mile wrestling with their shoes. Right at the start I felt like I had my breaks on. I jumped off and found that my brakes were rubbing my back tire. Yes, I checked this before the start, but things get bumped around in transition, so I didn’t sweat it. A quick fix and I was going again. No significant time lost. The first half of the course was really fast, but I made sure not to fall into that trap. I took it easy and didn’t let the heart rate float above 140. I was still passing a lot more people than were passing me (thanks slow swim), and made sure I took in plenty of fluids and food on schedule. I made it to the big hill at mile 27 at over 21 mph, and average HR under 140. I was really saving up for the upcoming rollers and the run. I did attack on the hills, but made sure to recover at every opportunity. The second half of this course is definitely more challenging than the first, but if you conserve in the beginning it will pay off. I was passing a lot more people at the end of the ride than at the beginning, and my heart rate was still where I wanted it to be. This bike course is nice! Except for a really bumpy stretch on Masterpiece, it’s pretty smooth. It was a really fun ride! For the first time ever in a race, I didn’t want to get off the bike and run. However, I was looking forward to what I’d set myself up for, having saved up all that energy and riding according to the plan. As smooth as I could have hoped for. Removed my shoes while I was still on the bike, which helped speed things along. I did forget to grab another Gu, but no worries since I could grab one at the aid station. One thing I’m happy I did was leave a water bottle for myself to take on the run exit. It’s about a mile from the run start to the first aid station, and I heard some grumblings about that during the first mile of the run. Aside from the typical transition legs, I left T2 feeling good. My heart rate immediately jumped up to the mid 150s, but I wasn’t too worried about that. I knew was probably running a little faster pace than I felt like I was, so I tried my best to slow down. That’s usually the case when I get off the bike–any pace feels slow just because the scenery has been going by so fast for the last couple of hours. I fought up the first hill, even though my HRM was beeping and telling me to walk. I listened halfway up the next hill, but my heart rate never dropped very much; about 157 was the best I could get it to. But I could still run and maintain that, so I did. I finished the first lap with a 9:48 pace, which was just a tad faster than I wanted to be. I started calculating in my head what my finish time would be if I could do that one more time and possibly speed up for the last 5k. The first hill won the battle the second time around, and by the time I got to mile 5 I was at 10 minute miles. I started doing the math and trying to hold that pace. Then the wheels started falling off. The last 8 miles turned into the hardest run I can remember doing. The real race of the day for everyone was against the weather and trying to finish before it got too hot. I lost that race, and once it got hot it kept getting hotter. About the only way I could get any relief for the heart rate was to fill my jersey with ice, but that didn’t last very long. It was also tough for me to take in enough fluid to replace what I was losing and continue to run without some serious sloshing. PR hopes were fading quickly, so I focused on calculating what I needed to do for a sub 6:00:00 finish. That kept my mind occupied for a while because I was run-drunk, but I knew it was getting really bad when I couldn’t remember what mile I was on. At that point, I stopped my watch. I was tired of hearing the HRM alarm anyway, and I decided to focus on going as fast as I could in the moment and let the chips fall where they may. I was somewhere in the last 5k, and that’s all I needed to know. I looked at the results for some other people in my wave, and it looks like many of them have similar stories. There were a lot of people walking up those two hills, not just me. Yeah, it was really only one kind of big hill and one medium hill, but on a three lap course in that heat, it turned into six pretty big hills. This run course is deceptively difficult in hot conditions. Don’t underestimate it. I picked off one last person just before the finish, and I got picked off by one last person just before the finish. I’m not sure if I just looked horrible, or if they’d been pulling a lot of people to the medical tent (maybe both? ), but I was immediately asked if I was ok. Now I have an idea how boxers who’ve been knocked down 2 of the allotted 3 times in a round must feel. I’m just happy I didn’t get knocked down that third time, and I was glad to preserve my 5:57:04, getting a finisher’s medal and hat as a bonus. I was greeted by my 4 biggest fans immediately. Then I crawled to the nearest shade I could find and took my shoes off. They were soaked for most of the run, and my feet took a pretty good beating. After a couple of bottles of water, I’d recovered enough to walk the oldest young’un to a porta-potty and hold her a few inches off the seat so she could do her thing–everyone who does stuff like this needs to be reminded that it’s not really about them–then I crawled back to my cave. The family headed back to the resort to get out of the heat while I headed over to the Athlete’s Lounge to get refreshed. Now here’s my only real complaint…not a single cold-cold beer to be found! I think a fella ought to be treated to at least one cold-cold beer after something like that. I can handle a limited selection of food. In fact, that burger was mighty tasty and the soda (which I never drink) was amazing. But it left me thinking that a cold-cold beer could have been that much better. I will go on record here saying that you get what you pay for with WTC events. It was the biggest, most organized, and smoothly operated triathlon I’ve ever done. Bonus points for pulling it off so successfully at a brand new venue. I was at the same race at Disney a couple of years ago as a spectator, and this venue was much more spectator friendly. The aid stations were very well stocked and staffed as well, and the volunteers were amazing. It was also great to see so many people out along the bike course to watch the race and cheer. That’s something you usually only see at bigger marathons. I don’t think I’ve ever seen a spectator on a rural bike route like that during a tri, so thanks to the good people of Polk County for coming out and making us feel so welcomed in the very first year at this location. We had an 11:00 am character breakfast reservation at Chef Mickey’s to celebrate someone’s successful potty training (not mine), and I was ready to tear into it. Pro tip: book character breakfasts as late as possible here and you won’t feel rushed to get out to make room for other people. You’ll also be so full that you won’t need to pay Mouse prices to eat again…it’s basically a huge lunch. Transitioning to my best event…breakfast! We saw the crowds at Magic Kingdom were going to be nasty, so we opted to go back to Hollywood Studios. It was already looking to be another brutally hot day, and there are lots of things to do in the shade and air conditioning there and at Epcot. We stayed until 8 pm, and this is the first time I’ve ever left a Disney park feeling better physically than I did when I arrived. I did just enough walking to loosen my legs up a little, and there was lots of sitting in the shade and relaxing–the “Honey I Shrunk The Kids Playground” rocks. I had some time driving home to think about what I could have done better or differently, but most of it is simply training. Initially, I was a little bummed about my time, but not enough to beat myself up over it. I don’t think there’s a whole lot more I could have done on race day. I executed my plan, but the weather didn’t want to cooperate on the run. There’s nothing I could have done to control that other than get waaay faster on the bike. And there’s not much I could have done differently in training based on the program I was using. I was as prepared as I could have been given where I started from. I did all my long runs in the heat of the day, but it didn’t really get hot here until a couple of weeks ago. Again, I couldn’t change that. Tuesday is P-90x stretching and 15 minutes or so treading water. Wednesday is an hour on the bike. I’ll swim Thursday, rest Friday, run semi-long this weekend, and plan on starting some CrossFit endurance stuff next week. I’m thinking a June swim clinic could help change some things for me. I’m a reasonably efficient swimmer with a slow turnover, but I think I’ve gone about as far as I can with that and need to learn to turn over faster with efficiency. That will take coaching. My run isn’t where it has been before, which means it’s not where it can be. I’m thinking a fall marathon will help remedy that. I don’t ever want to go into a 70.3 (or longer) again without having done the full run distance within the last 6 months. It had been almost six years since I’d run 13.1 before this race, and that just didn’t have me where I needed to be physically or mentally. More weight loss is definitely part of the plan as well. That glutinous breakfast was a last hurrah…at least for a little while. Here are some race reports other people have posted. If you come across any other good ones, let me know in the comments and I’ll link to them!!! Libby Bergman’s got a really good, honest race report with a happy ending. Transition Practice Works…Who Would Have Thought?